Put your flippers in the air like you really don't care. Here's how you can put both Club Penguin flipper up in the air. Step 1. You can't be wearing anything. Step 2. Put on a Tour Guide Hat or Face Painting. Step 3. Do NOT close your Player Card. NOW YOU CAN PUT BOTH CLUB PENGUIN FLIPPERS IN THE AIR. Here is a cool trick. 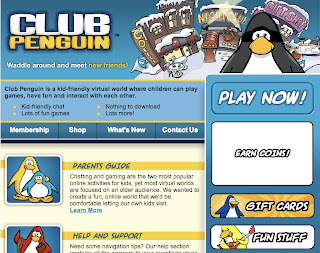 You can change the big blue penguin on clubpenguin.com home page. Step 2. Click on the "N" on the "Nightclub" sign on the banner. Step 3. Now repeatedly click on the big blue penguin to change it. NOW YOU KNOW THE SECRET OF CHANGING THE CLUB PENGUIN BLUE PENGUIN. Awesome! Which one's is your favorite? We like the Ninja the best. If you know of any other Ninja secrets, post them here. Glitch: Chat in a No-Chat Server. Here is how to chat in an Ultimate Safe Chat Only (chat disabled) server. Step 1. Log onto a no-chat server (see pic above). Step 2. Now go into any room. Step 3. Click on "Edit Account." Step 4. Uncheck the "ultimate Safe Mode." Step 5. Now close the window. Step 6. Click on Map and now go into a different room. 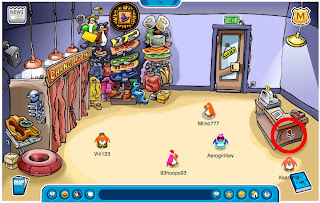 NOW YOU CAN CHAT IN A CLUB PENGUIN NO CHAT SERVER! 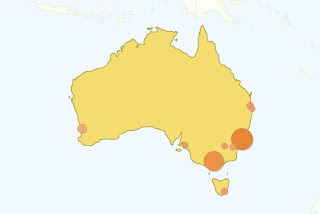 Hello Club Penguins Down Under! The Club Penguin Gang just wanted to say "Hi" to all our friends in Australia! Especially those in Sydney and Melbourne. Leave us a comment. We'd love to hear from you. Hint: Find the new Club Penguin Secret Pin! Here is how to find the new secret pin released May 26th. Step 1. Go to the Map icon. Step 3. Look at the star on the back wall. NOW YOU'VE FOUND THE CLUB PENGUIN SECRET PIN! Did you find it right away or did you need help? Here is how to find the Club Penguin rare Snow Globe home. Step 4. Click on page 2 and click on the word, "snow." Step 5. Click on page 12 & 13 and click on the 3 words, "snow." Step 6. Click on page 14 and click on the 2 words, "snow." Step 7. 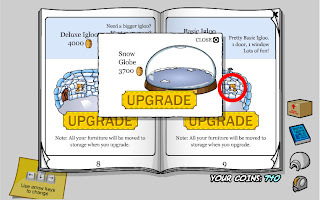 Go back to page 9 and click on the Basic Igloo's window. YOU NOW HAVE THE SECRET & RARE SNOW GLOBE HOME! After you buy it, you can even shake it to see it snow. Now THAT is an awesome secret don't you think? Did you know you can go full screen in Club Penguin? Here's a hint, to try it out just click here. Sony to buy Club Penguin? Click here to read the full story. What will that mean for all us Penguins out there? We are guessing Sony will integrate Playstation and other Sony advertising into Club Penguins. No big deal, right? As long as they keep the cheats, hints, glitches and secrets. We love those! 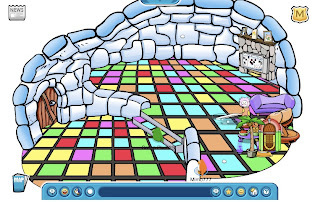 Here's the newest Club Penguin Secret DELUX Stone Igloo. 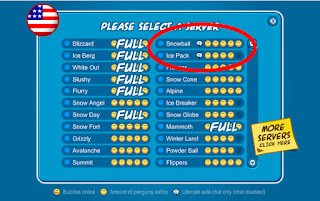 Here is how to find the newest Club Penguin Secret DELUX Stone Igloo. Step 4. 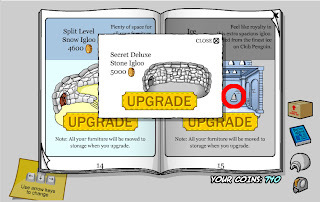 Click on page 15 of the "Igloo Upgrade" magazine. Step 5. 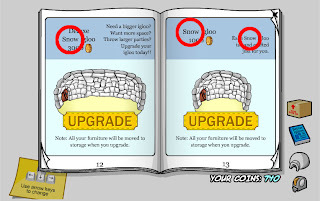 Click on the right window of the Ice Castle circled in red above. YOU NOW HAVE THE SECRET DELUX STONE IGLOO! Teach us something we don't know. Find the newest Club Penguin Secret Stone Igloo. Here is how to find the newest Club Penguin Secret Stone Igloo. Step 5. Click on the Blue Diamond Linoleum. Another 2000 extra coins, Woo Hoo! 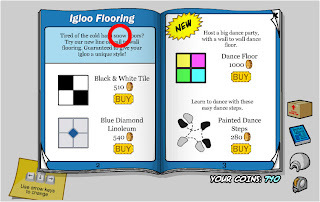 Glitch: Move funiture in a members igloo! 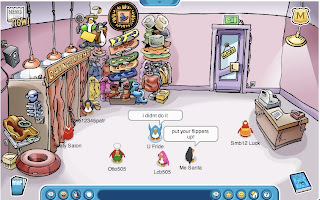 Here is how move furniture around in a Club Penguin member's igloo. Step 1. Click the "Your Home" icon. Step 2. Click on your door, NOW QUICKLY CLICK ON THE TAPE MEASURE ICON. Step 3. Now click on the Members Igloos. Step 4. Select any members Igloo. Step 5. Now you can click on any item and move it! 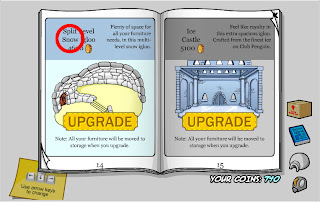 Secret levels in Club Penguin Astro Berrier! Here is how find a SECRET level in Astro Berrier. Step 1. Click the MAP icon. Step 2. Go to "Town". Step 3. Click on the "Night Club" door. Step 4. Now go upstairs. Step 5. Click on the "Astro Berrier" game. Step 6. Click Start. Do NOT press "Enter"! Step 7. You must go to the 10th level by pressing "1"on your keyboard. Step 8. Now you must play and pass level 10. Step 9. WAIT on the next screen between 20 and 30 seconds. Step 10. Now shoot the blue ship. 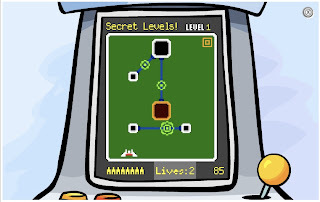 NOW YOU YOU WILL BE TAKEN TO THE 10 SECRET LEVELS IN ASTRO BERRIER! Cheat: Skip levels in Club Penguin Astro Berrier! Here is how you can skip to the 10th, 20th or 30th level in Astro Berrier. Step 7. Now press "1", "2" or "3" on your keyboard to go to level 10, 20 or 30. 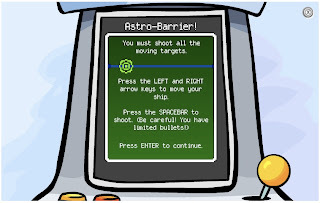 NOW YOU KNOW HOW TO SKIP LEVELS IN ASTRO BERRIER! Find the hidden Club Penguin Royal Throne. Here's how to find the Club Penguin Royal Throne. Step 1. Click "Your home" icon. Step 2. Click the "Edit Room" icon in the lower right. Step 3. 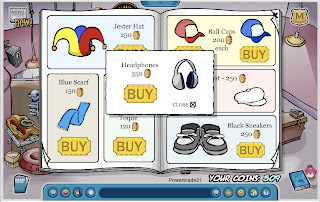 Now click, "Buy Items" in the lower right. Step 4. In the "Better Igloos April/May" magazine, click to the 4th page. Step 5. 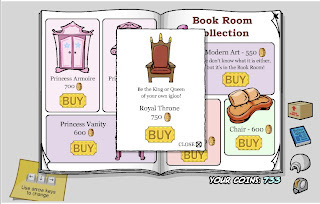 Now click on the word "Throne" Next to the Princess Throne. NOW YOU KNOW HOW TO FIND THE CLUP PENGUIN ROYAL THRONE! Would you consider this a cheat, hint, or secret? Find the Club Penguin Big Screen TV! Here's how to find the Club Penguin Big Screen TV. Step 4. In the "Better Igloos April/May" magazine, click to the 10th page. Step 5. Now click on the letters "LCD". 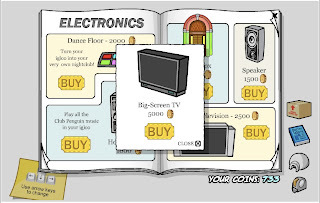 NOW YOU KNOW HOW TO FIND THE CLUP PENGUIN BIG SCREEN TV! Here's the new Club Penguin secret pin! Here is how to find the new secret pin released May 11th. Step 2. Click on the "Ski Villiage." Step 3. Click on the Winter Sport shop. Step 4. Look at the flower on the side of the counter. Find the Club Penguin Secret Stone Igloo. 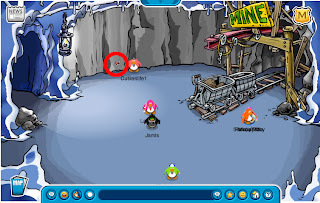 Here is how you find the Club Penguin Secret Stone Igloo. Step 4. 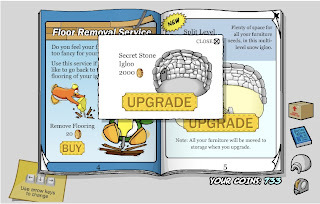 Click on page 4 of the "Igloo Upgrade" magazine. Step 5. Click on the tip of the orange penguin's jack hammer. YOU NOW HAVE THE SECRET STONE! Here is how to make a Club Penguin Chocolate Sugar Pizza. Step 1. Click the Map icon in the lower left. Step 2. Click on The Plaza. Step 3. Click on the door to the Pizza place. Step 4. 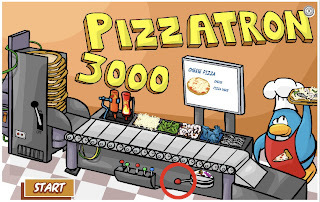 Click on the Kitchen (Play Pizzatron). Step 5. Now click on the red lever to open it to the right (see pic above). 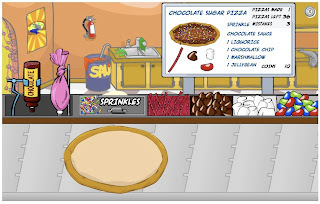 YOU ARE NOW MAKING A CHOCOLATE SUGAR PIZZA! TIP: How do you catch the Mullet (Big Fish)? Step 1. Go to the Map icon in the lower left. Step 2. Click Ski Village. Step 3. Click on the Log Cabin's door. Step 4. Click on the Gone Fishing door. Step 6. Toward the end you will see the mullet fish swimming in the background. Step 7. 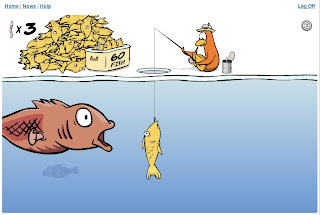 You will need to catch a regular fish and use it as bait. Step 8. Keep the fish in the water and on your hook until the mullet comes up and bites. YOU HAVE NOW LANDED THE MULLET FISH AND 50 EXTRA COINS! Do you know any Ice Fishing tricks? Trick: Make your Penguin Float! Here is how you make your Penguin float. Step 2. Click "Edit Player" in the chat bar. Step 3. Put on your propeller hat. Step 4. Click "Actions" in the chat bar. Step 5. Now click the Dance icon. Step 6. Make sure to keep your Player Card open! YOU ARE NOW FLOATING IN MID AIR! Step 1. Click on the Map icon in the lower left corner. Step 2. Go to Town. Step.4. Click on the blue magazine icon in the lower right corner. Step 5. 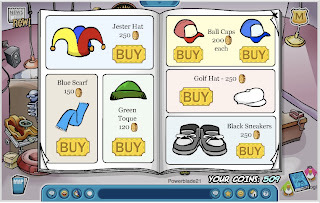 On the 8th page you will see a "Green Toque". Step 6. Click on the Green Toque. And no, they are not ear muffs, silly. 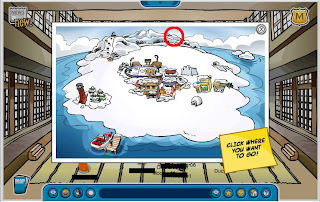 TIP: Do you know where the Club Penguin Dojo is? Step 2. Find and click on the snow capped mountain. (Circled in red in the picture above). YOU ARE NOW IN THE DOJO! Do you know what a Dojo is? It's a school or practice hall where karate, judo, or other martial arts are taught. But I bet you already knew that. Right? Step 2. Click on "Town"
Step 3. Click on the Coffee Shop door. Step 4. Click on the stair case. Step 5. Click on the Book icon in the lower right. Step 6. Click on the book "Rockhopper + The Stowaway." Step 7. Go to the last page. Step 8. Now click on the colorful Friendship Bracelet. 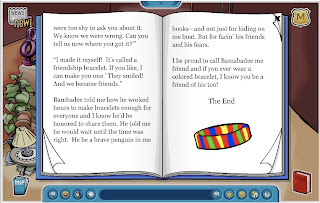 AND NOW YOU'VE FOUND THE CLUB PENGUIN FRIENDSHIP BRACELET! Step 1. Go to the gift shop. Step 2. Click on the magazine icon in the lower right called, "Penguin Style May '07." Step 3. Go to about page 7 where you see the pink "Flower Hat." Step 4. Click on the Flower Hat. YOU HAVE NOW FOUND THE CLUB PENGUIN RED VIKING HELMET! Step 5. Click on the pink Flower Hat. Step 7. Repeat steps 5 and 6 THREE TIMES and the blue Viking Hat will appear! 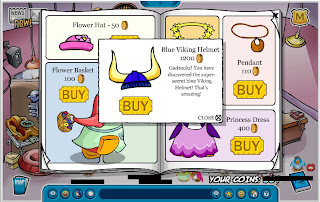 YOU HAVE NOW FOUND THE CLUB PENGUIN BLUE VIKING HELET! Are there any other colored Viking Hats you've found? 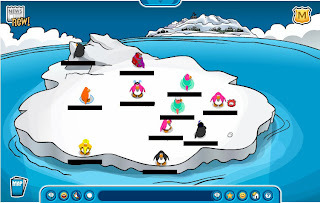 Can you tip the Club Penguin Iceberg? We've been around Club Penguin awhile. And we've heard constant rumors about being able to tip the iceberg. 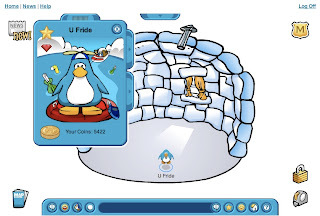 We've heard stories like, "if you tip the iceberg you get 5,000 coins and a Golden Puffle." And, "you need at least 100 penguins in the iceberg to be able to tip it." The problem with that is the iceberg only holds 50 penguins at a time. So, let's put this whole thing to rest. YOU CAN'T TIP THE ICEBERG! You think you know something we don't? Prove it! Step 2. Click the tape measure, "Edit Room". Step 3. 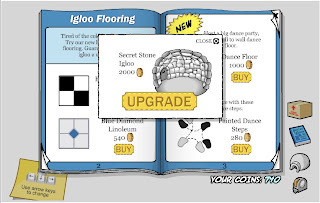 Click "Upgrade Igloo"
Step 4. 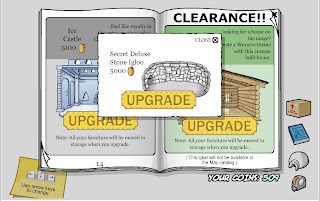 Then in the "Igloo Upgrade" book, go to the "Log Cabin" page. Step 5. Click on the window in the Log Cabin.